Seven years ago, Chris Offutt made his literary debut with Kentucky Straight, a fiercely original collection that earned him not only critical praise but many prestigious awards. 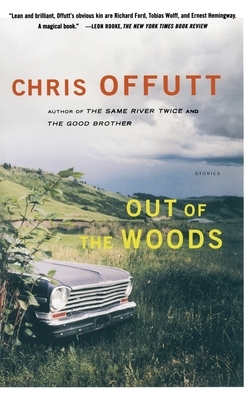 The eight new stories in Out of the Woods mark Offutt's return to the form in which he first displayed his astonishing talent. Offutt, who "draws landscape and constructs dialogue with the eyes and ears of a native son" (The Miami Herald), is on strong home turf here, capturing those who have left the Kentucky hills and long to return. These are stories of gravediggers and drifters, gamblers and truck drivers a long way from home, tales that are so full of hard edges they can't help but tell some hard truths. Leon Rooke The New York Times Book Review Lean and brilliant, Offutt's obvious kin are Richard Ford, Tobias Wolff, and Ernest Hemingway. A magical book. Dan Cryer Newsday Out of the Woods has the quiet majesty of classic American fiction. This is beautiful prose -- as clear and pure and flowing as a mountain stream. Offutt packs more emotion, and more emotional truth, into a sentence than any American writer since Raymond Carver. Leigh Hopper Houston Chronicle A bracing collection of tales that linger in memory like a bird's call, haunting and beautiful. Scott Martelle Los Angeles Times Among the best short-story writers of his generation. William Kittredge It's my theory that I'll be reading Chris Offutt's stories from now until I'm far too gone to read. And then my grandchildren will read them aloud to me. The stories in Out of the Woods are emotionally accurate, incessantly vivid, and utterly compelling. This is a talent for the long haul. Chris Holbrook Chicago Tribune Further proof that Offutt is a lasting literary talent on a national scale...If you haven't read Chris Offutt, you've missed an accomplished and compelling writer....Masterfully written, insightful, and altogether unforgettable. Laura Demanski Baltimore Sun Offutt never uses a metaphor that isn't perfect, nor one that doesn't reveal character....Prose doesn't get any sharper than Chris Offutt's. The New York Observer Spare and moving...Offutt provides no clear resolution regarding what home means for his characters. Rather he simply examines the mystery of its meaning for them, handling and burnishing it, then quietly slipping it into the reader's hands for perusal. That, perhaps, is what the best fiction aims to do and what this collection of stories succeeds in doing magnificently. Rick Moody Book Forum This is good storytelling...Out of the Woods is a splendid, compulsive, heartbroken, misleading sequence of American yarns. Brian Alexander San Diego Union-Tribune Terrific...Offutt's genius is how thoroughly he can scare you into seeing yourself in this hardscrabble lot that is neither here nor there....Offutt's stories of these people are especially welcome now, as we sprint headlong into the mass global village of the information age, another form of going.